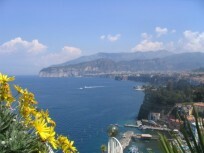 Sorrento stands on a terrace rising steeply above the sea on one of the most spetacular points of the Campania coast. Because of its enchanting position and mild climate, sheltered by the surrounding hills, Sorrento has been a favorite resort since Roman times. Positano the center of the town is enchanting; among the delightful white or pastel-coloured houses stands the parish Church of Santa Maria Assunta with its splendid majolica Dome. Positano combines the beauty of its beaches with the fascination of its ancient fishing port and lanes crowed with quaint colourful shops. 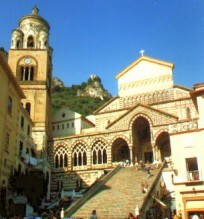 Amalfi, the town preserves important evidence of its prestigious past: the cathedral, dedicated to St.Andrew, dominating the square of the same name from above steep steps, the paradise cloister a construction in Arabian-style dating to thirteenth century and the ruins of Arsenal of the republic. Ravello is situated in a more elevated position than the other pearls of the Amalfi coast and it can boast exceptional landscapes that have earned Villa Cimbrone's terrace the name of terrace of infinity. On the right of the dome stands the beautifull Villa Rufolo and its gardens.